CY2823 is an USB Car Charger which integrates a DC/DC converter and a Type-C+ QC 2.0 charger decoder together. For the DC/DC converter, it covers a wide input voltage and provides high efficiency current mode control during the step �C down process for fast loop response and easy compensation. For the charger ID capability, this device has different charger types including emerging Type-C, QC 2.0 Class A, BC 1.2, DCP modes, and legacy devices. The DC/DC converter of CY2823 provides a 3A, current-mode step-down converter with an integrated high-side switch. It operates with a wide input voltage from 4.5V to 36V, and the PWM switching frequency fixed at 420kHz internally. Meanwhile, it performs a highly efficient control for fast loop response and easy compensation by automatically entering into PSM mode during light load. Also, cycle-by-cycle current limiting and thermal shutdown are provided for fault condition protections. An internal 2ms soft-start design reduces input start-up current and prevents the output voltage and inductor current from overshooting during power-up. 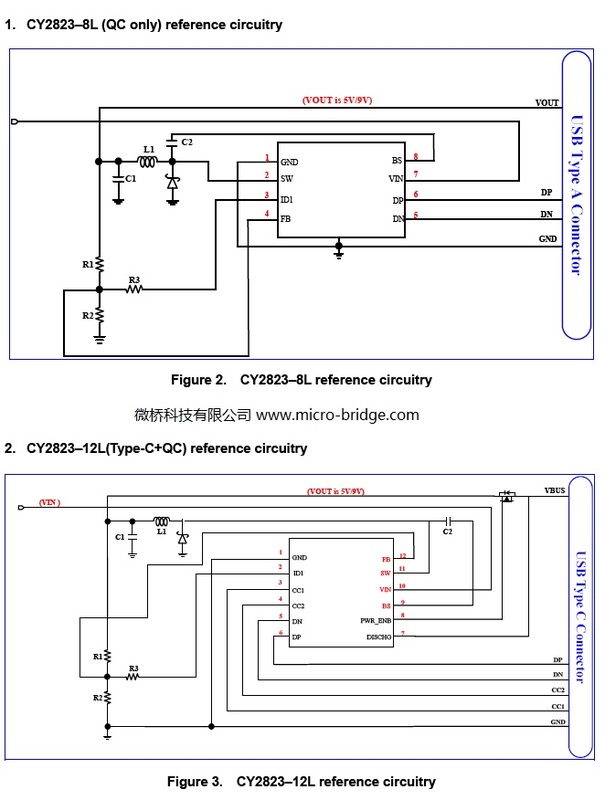 The detection procedure of CY2823 firstly performs Type-C detection ( for CY2823-12L) based on USB Type-C specification v1.1 for Downstream Facing Port. And then, USB BC 1.2 DCP mode is enabled. After that, the legacy (500mA USB 2.0, 900mA USB 3.0, 2.4A for D+/D- at 2.7V) detection is performed. In addition, QC detection is implemented with class A capability, where VBUS can support 5V, 9V, or 12V according to QC protocol handshake results.